Hartlepool looking south at the south east corner of the town. 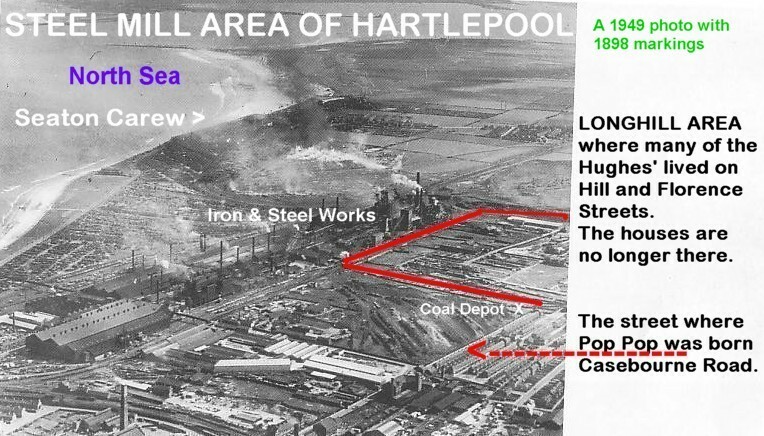 This area was in West Hartlepool when the Hughes Family lived there at the end of the 1800's and early 1900's. My great grandfather, John George Hughes, coal dealer, probably did his daily business at the coal depot marked on the map. My great great grandfather, George Henry Hughes, a puddler, worked in the Iron & Steel Mills adjacent to Longhill where he lived. Later, George Henry Hughes owned a Grocery and Provisions store on Florence Street in the Longhill section. P.S. My family knows this, but for others....Pop Pop born on Casebourne Road is my grandfather, George Henry Hughes, son of John George Hughes and grandchild of George Henry Hughes.